HOW TO EAT FIGS, IS THERE WASPS IN FIGS?? Wasps in Figs? Can you see them in this video? We also show you how to eat figs without burn your mouth! Figs is such a fantastic fruit especially organic figs. We love figs but recently heard it could be worms in figs or wasps there laying eggs. Anyhow in this video we show you how to cut figs and how to eat figs with our burn your mouth. Today we found a supercool fruit here in Bali, it is called Grenadilla or Giant Passionfruit! Here is a video when we open it and try it! 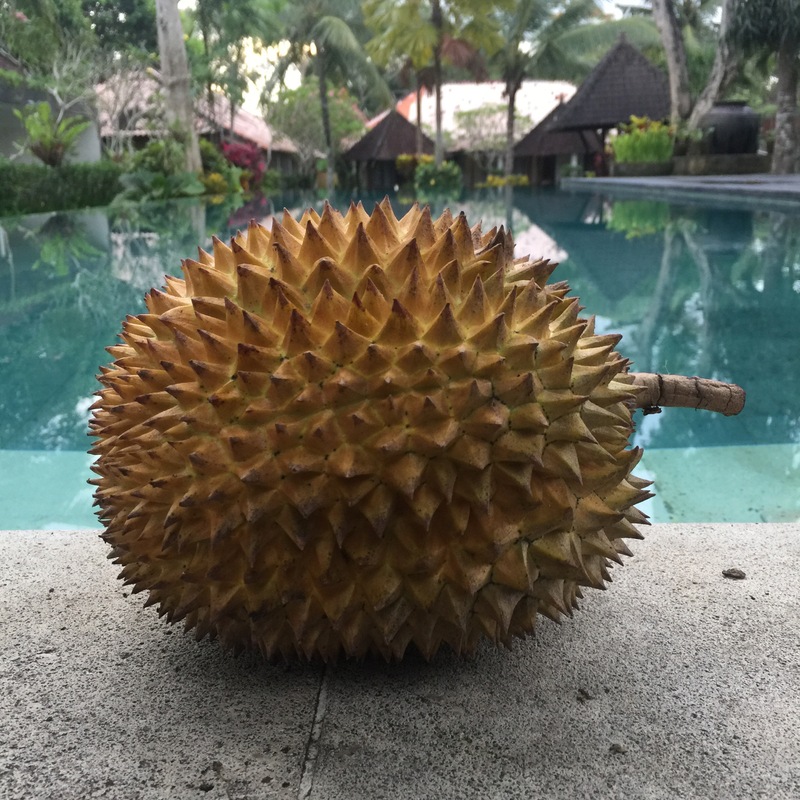 Our first Bali durian for the season! 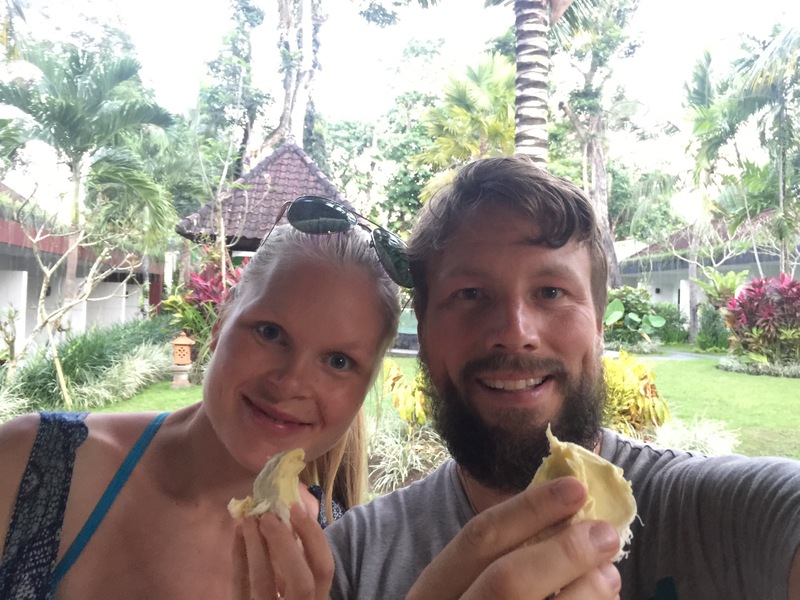 Two days ago we enjoyed our first Bali durian for this season and let us tel you it was a good friend back in bussines. We had seen some on some street stalls but not any that we thinker looked good. so we did not by any as we want the first durian for the season to be memerabol. Two days ago we went to our lovely Balinese friend and his family to visit them. When we ware leaving his wife came with a big bag of fruits, a big bunch of bananas (Pisang Andong), 2 papayas, 3 mangoes and in a nother bag…. Durian or as we cal him Mr D. We could smell the lovely aroma when she came walking with the bag. So so lovely of them as they know we love fruits and especially durian. She found it on the local market earli in the morning as she her self sells there. This is such a nice thing of them to do as they don’t have so much money. They are so genuine, friendly and we are so happy we have become friends. As we ware walking back to the resort, we ware so happy to have a durian in the bag. But we did not have so big expectations as it’s in the beginning of the season. Straight away when we came to the resort we ripped it open with love. A durian is so amazing, always a suprice. It’s the moust exiting thing to open and eat. But it’s s fruit you have to share, not a fruit you can eat by yourself, otherwise it’s loses it’s magic. We ware so exited, we took each a pease and a some seconds of silence and then a mmmmmm aaaaa indicated that it was a good one. 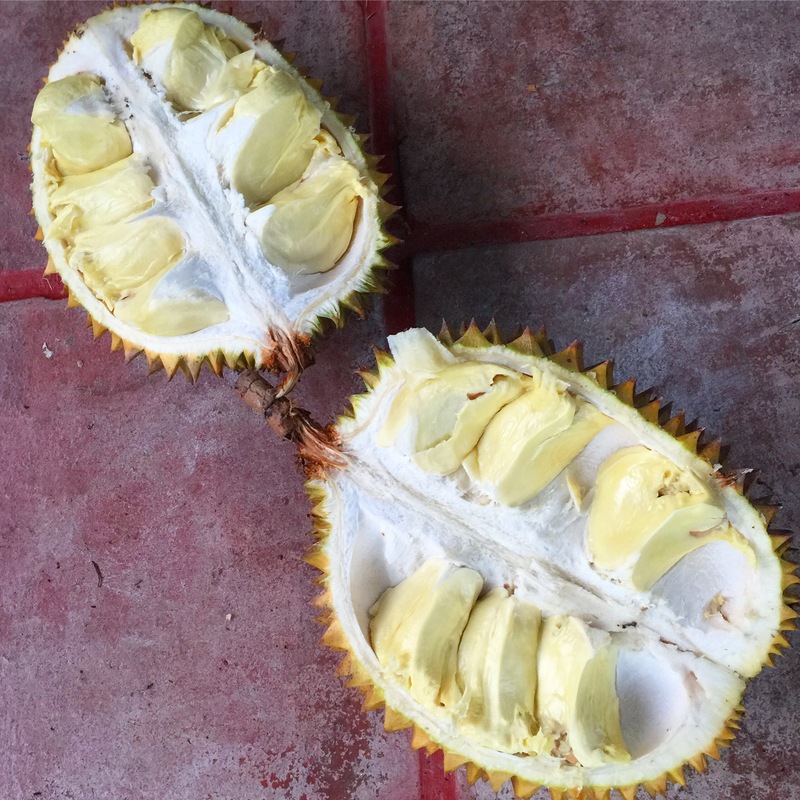 It was lightly yellow, big seeds but ok with durian flesh around it. Had a sweet but not to sweet tast, semi creamy, some pleases was really creamy. It was a 5,5 out of 10 durian if you only compare with the other Bali Durian’s we have eaten. We ware in durian heaven. A family we had talked to came out and we offered them to try, but they sad ~no but thank you, we tryed it in Thailand but did not like it. So we sat there in the gazebo next to the pool and pease after pease enjoyed it. The worst thing with eating durian is that after it’s finished you only want more and more and wished you had some more to dig in to. It’s so addicting! 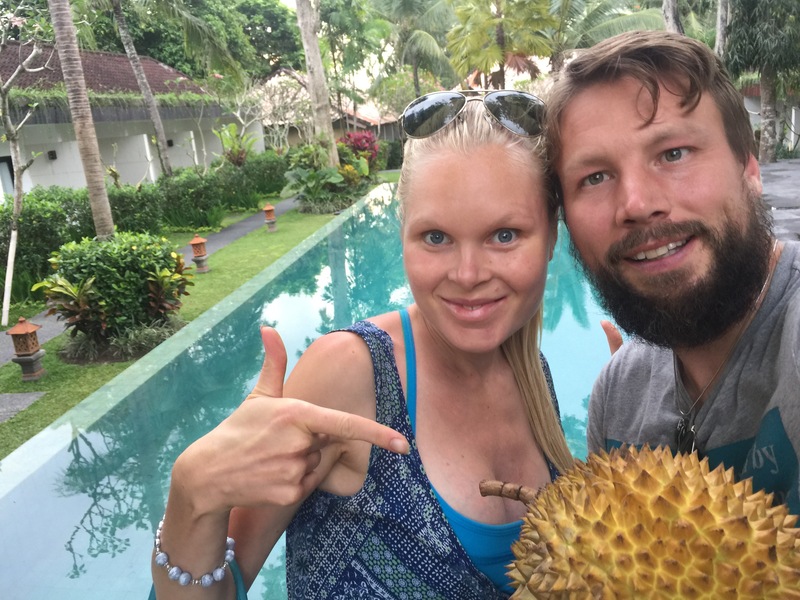 Now the durian hunts begines for two durian addict like us, to find the best ones out there. The best thing is that the durian season in Bali probably is to the end of April and we know the best hidden spots to find the greatest ones. But still a lot of places to explore. Lots of durian love from us! Do you love Mango? We love mango and its amazing tropical smell, always when you feel the smell you think yourself away to some of our adventures around the world! We remember when we were in Singapore and got on a sightseeing by a local on places you normally never visit. We got into a forest and there was one of the biggest mango tree we ever seen and the smell from it was just amazing! Like a punch in your face of mango-mania. There are so many mango types in the world so we want to share our latest video about Mango, it is a mango from Egypt that is one of the smallest mangoes we ever seen. Got it from a friend Samir who is from Egypt and he brought it from there to share some of his homecontries fruits when he heard we love to open and explore fruits from all around the world. So thank you so much Samir for make this video possible! Can you eat a Kiwi Fruit with the skin? Today we will show you how to eat Kiwi fruit the best way and show you some benefits of the beautiful fruit from as we know best New Zealand! “In the world of phytonutrient research, kiwifruit has fascinated researchers for its ability to protect DNA in the nucleus of human cells from oxygen-related damage. Researchers are not yet certain which compounds in kiwi give it this protective antioxidant capacity, but they are sure that this healing property is not limited to those nutrients most commonly associated with kiwifruit, including its vitamin C or beta-carotene content. Can you eat the Skin? Cantalope Melon a really healthy fruit! Today we going to talk about one very delicious fruit! That we really love! We talking about the Cantaloupe Melon, now especially when it is summer it is so delicious to eat a cold cantaloupe and enjoy the beautiful day that universe brought us! What melons are your favorite? We love all kind of melons but the cantaloupe is one of the delicious ones we use to get shipped from Spain to Sweden during summer. We use to go to the store and smell and press on the melon until we find the best one! Back in the days it was kinda hard in Sweden to find organic cantaloupe melons, but nowadays we see them more and more often in the supermarket, which make us very happy! So now during the summer we always looking for an organic cantaloupe. Best way to cut and eat Cantaloupe Melon! Today as always when we talk about fruit, we made a video that explains how to cut and eat a Cantaloupe Melon the best way and also how to see if the melon is ripe, Enjoy! Cancer: Rich in beta-carotene from plant foods like cantaloupe may play a protective role against prostate cancer. Skin and hair: Eating fruits like cantaloupe are beneficial for your hair because they contain vitamin A, a nutrient required for sebum production, which keeps hair moisturized and healthy. Digestion: Cantaloupe, because it is high in both fiber and moisture, helps to prevent constipation, promote regularity and maintain a healthy digestive tract. Hydration: With its high water and electrolyte content, cantaloupe is a great snack to have on hand during the hot summer months to prevent dehydration. Inflammation: Choline is a very important and versatile nutrient in cantaloupe that aids our bodies in sleep, muscle movement, learning and memory. Choline also helps to maintain the structure of cellular membranes, aids in the transmission of nerve impulses, assists in the absorption of fat and reduces chronic inflammation. Blood pressure: The fiber, potassium, vitamin C and choline content in cantaloupe all support heart health. Consuming foods that are high in potassium can help to decrease blood pressure. Hope you enjoyed this blog post and go out there hunting for some superyummy organic Cantaloupe Melon. What is your favorite Melon? Comment in the comment field, would love to hear your opinion! Today we give you something very special! 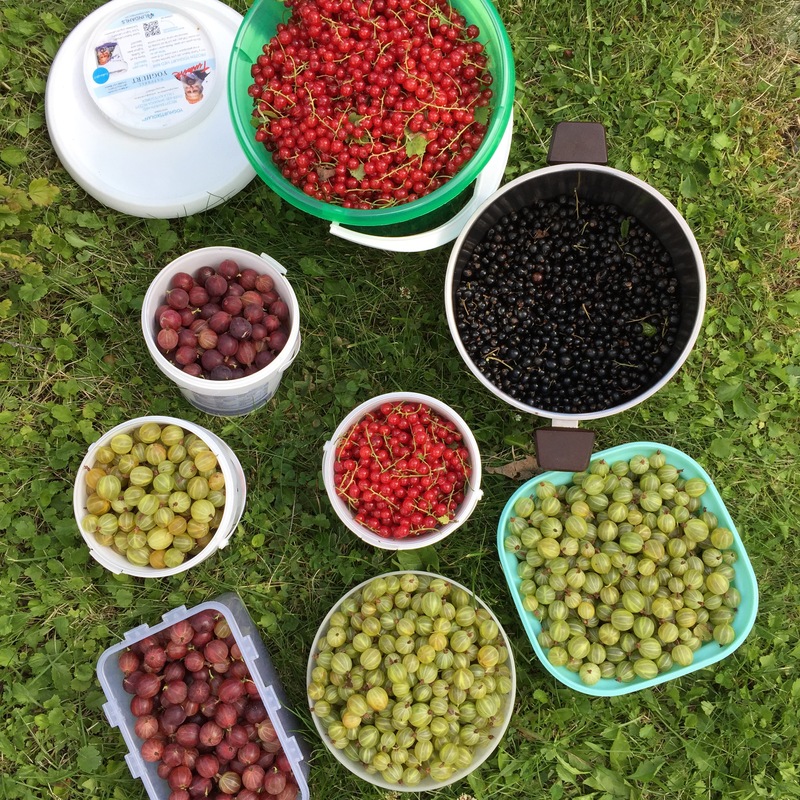 We are in Sweden and show you what kind of wild berry’s you can find in Sweden during summertime! We have a lot of fantastic extremely nutritious hidden treasure in Sweden and everything comes alive in during the summer! We travel a lot but love to be here in Sweden this time of year to explore this and enjoy the beautiful days of sun, abundance as well as family and friends! 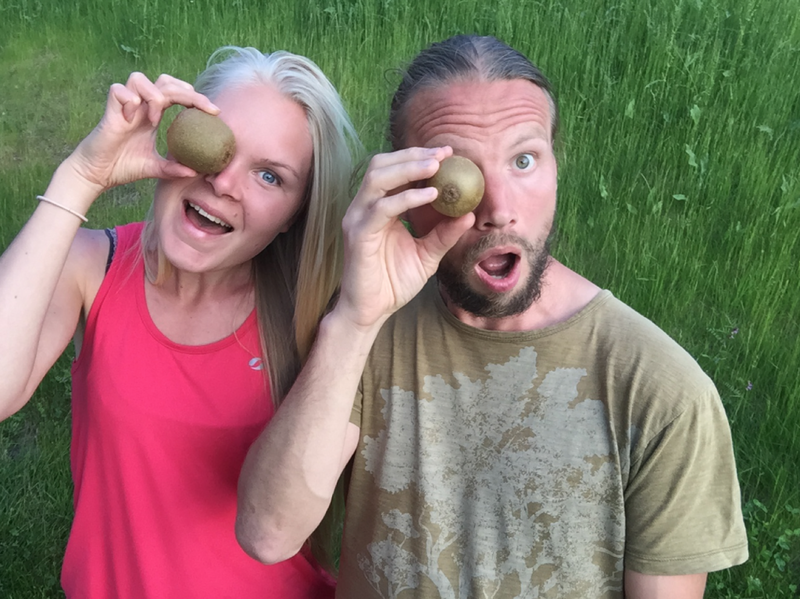 Today we give you a video from our berry hunting in Sweden enjoy! We also done a lot of how to eat and health facts of this fantastic berry s to watch them check our YouTube Channel MT WorldHave a beautiful day!